Featuring five reels and just ten paylines, this game is typical of other Cryptologic slots in that it has a clean and simple interface, less than average paylines and one funky bonus game in which it’s possible to win the progressive jackpot. The diamonds sparkling above the reels give the player an immediate impression of riches and all the symbols maintain that impression; we have a pendant, champagne, golf clubs, a watch, a ring, a huge diamond, a luxury car, a yacht and a private jet. Special symbols are a platinum credit card wild and a pile of cash/diamonds scatter which triggers the bonus game. Despite it’s relative simplicity, Millionaires Club contains a nice bonus game which lasts long enough to give you some real satisfaction (and hopefully some profit). 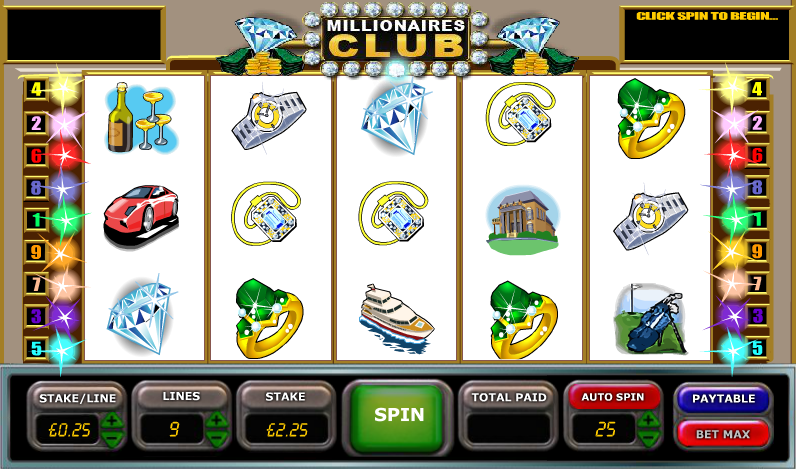 Its a Wheel of Fortune-style game which is activated by landing three or more of the scatter symbols anywhere on the reels. You will now see the wheels and the idea is to reach the jackpot by landing the pointer on the inward-pointing arrows to progress. If you land on a number, that will be multiplied by your stake and will accumulate as a prize; that number will then turn into a ‘B’ for bust. Land on B and it’s game over with a consolation prize. You can collect your winnings at any time and end the feature and it’s also worth noting that you’ll only get one spin on the jackpot wheel. That jackpot is of course the progressive jackpot which will win you a life-changin amount of money. This game is all about the choices you make when playing the bonus game – if you fail to land on the inward-pointing arrow several times the Bust segments will accumulate, making further wins unlikely. Take your money early unless you really want a shot at the jackpot. This slot may be a little dated but it’s still good fun and there’s a progressive jackpot available. We should also say that the RTP is just 91.50% and that’s pretty low for those who take note of that sort of thing.